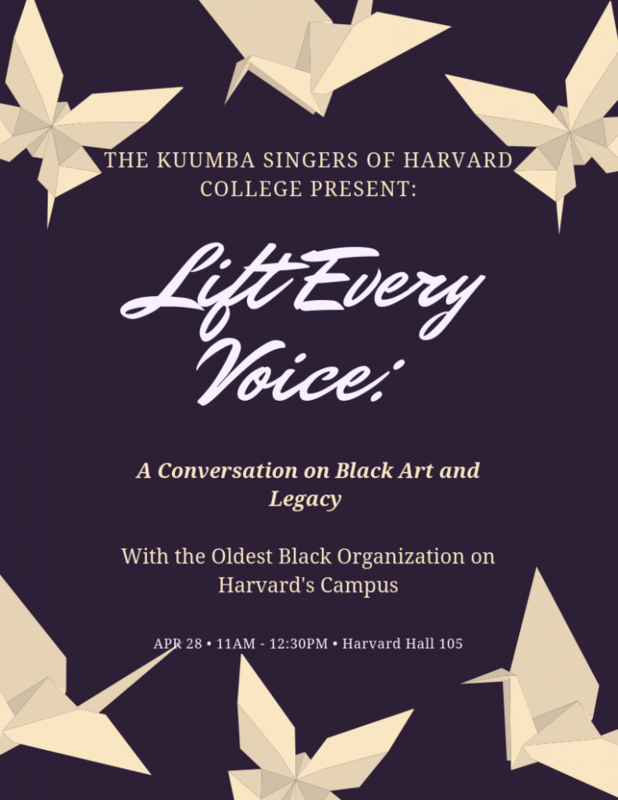 As Harvard College’s oldest black organization, the Kuumba Singers are happy to announce a Visitas conversation about what it means to identify as a black artist in a space that is predominately white. Prefrosh, current Harvard students and anyone interested is invited for a discussion and performance! Light refreshments will be served! Love Train: A Journey Through Black Love! Through all the triumphs and tribulations Black people have faced, Black love has endured and thrived in all its various forms. From romantic love to familial love to spiritual love, Black love permeates through the Black community and breathes life into our relationships with one another and ourselves; without it, the adversity we face would be unbearable. Black love’s resilience, beauty, and might rests within us and cultivates the hope we need to continue to survive. We would like to invite you to join us in celebrating the multiplicity and majesty of Black love through song, dance, and poetry. You won’t want to miss this! 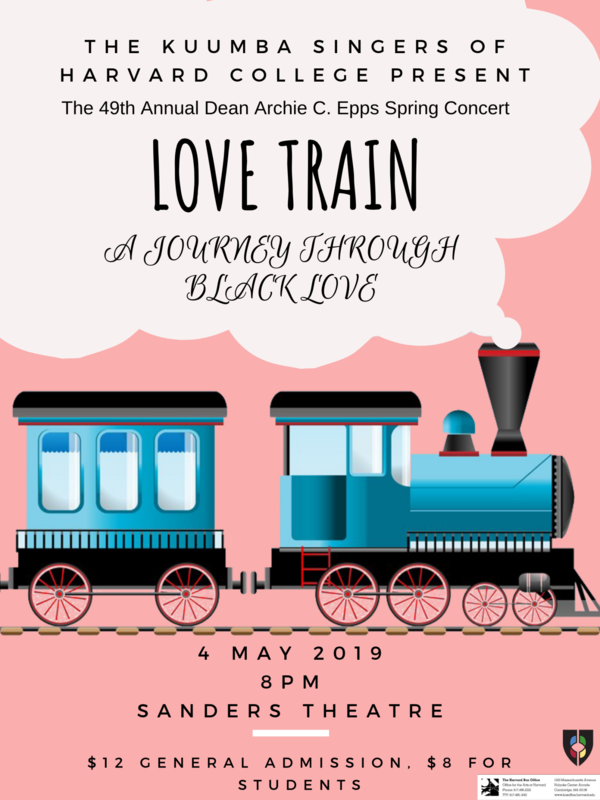 Please join us for “Love Train: A Journey Through Black Love,” our 49th Annual Dean Archie C. Epps Spring Concert. Tickets will be available through the Harvard Box Office; visit its new location in the Smith Campus Center, go to www.boxoffice.harvard.edu, or call 617-496-2222. The Kuumba Singers of Harvard College are honored to host a discussion with Lt. Col. Enoch Woodhouse II, J.D. Col. Woodhouse, currently 92 years of age, is a life long resident of Boston and graduated from Boston English High School in 1944. When WWII began, his mother called upon him and his brother to serve our nation. 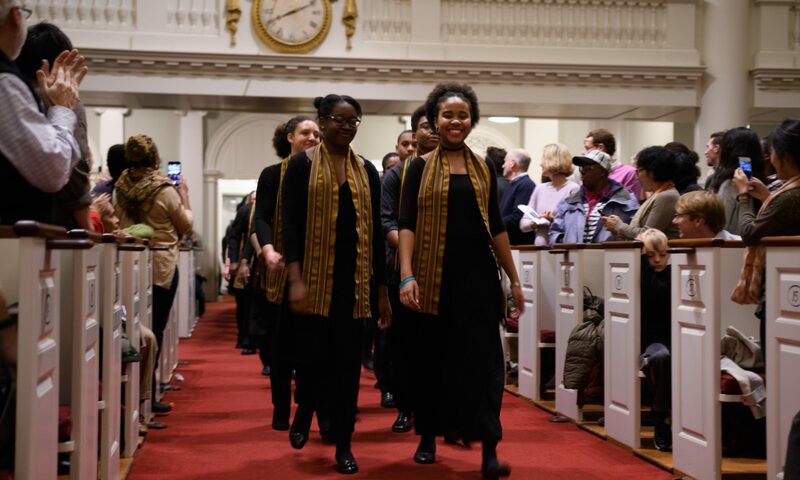 He volunteered along with 20 other Boston English High School students upon graduation. He was 17 years old. His brother would become one of the first black Marines at Montford Point, North Carolina. Col. Woodhouse’s first assignment, as an enlisted man, was in the Army Air Corps and he was assigned to a housekeeping mission. At the age of 19, he attended Officers Candidate School and was commissioned a second lieutenant. He was then assigned to the 332nd Fighter Group of the Army Air Force, commonly called The Tuskegee Airmen. This distinguished group consisted exclusively of African American pilots and officers, and became one of the most decorated units in the Army. Upon his discharge, he joined the Air Force Reserves and attended Yale University and Boston University Law School. He practiced law as a Diplomatic Courier for the State Department in Europe, Africa and South America. Thereafter he served as Deputy Assistant Corporation Counsel for the City of Boston, began his own law firm in Boston and continued in private practice as a trial lawyer for over 40 years. The Congressional Medal of Honor awarded in 1972 to the surviving members of the Tuskegee Airmen by then President George W Bush. There are only 22 surviving members. There are only about 75 living Medal of Honor recipients in the US today. Service Award from the Episcopal Church as he currently serves as a deacon to Trinity Church in Copley Square. 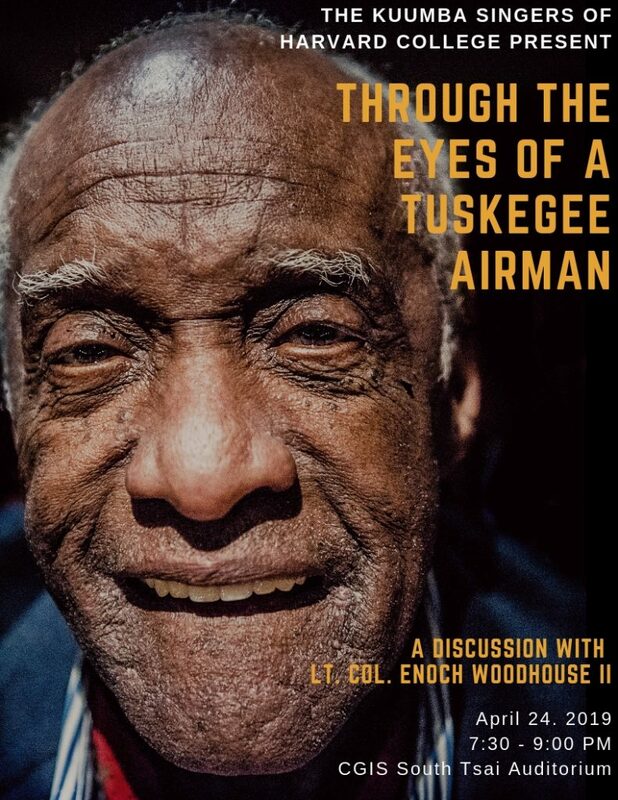 Please join us in a discussion with Col. Woodhouse about his struggles, triumphs, and history he has seen in his amazing life.